PSBank and Metrobank launched the Cardless Withdrawal feature wherein customers can withdraw cash at any of their 2,400 ATMs across the country without the need for the physical ATM card. Sounds very convenient, right? Especially when you badly need cash and you forget or misplaced your ATM card. The account holder of both banks can now access their money through Mobile Banking Apps and withdraw cash anytime. Follow these simple steps in using the Cardless Withdrawal feature. 1. 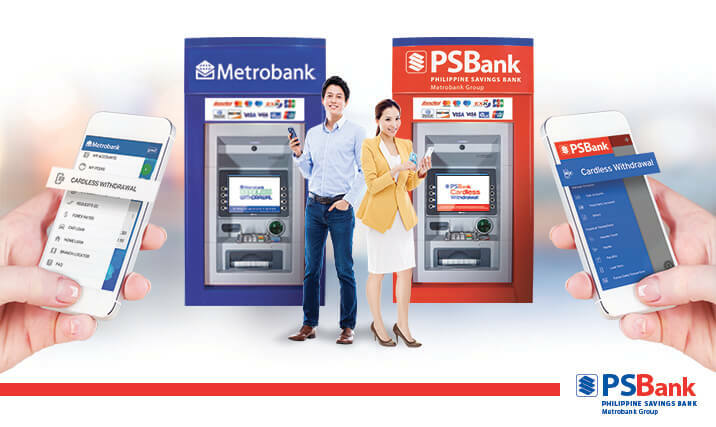 Log in to your PSBank or Metrobank Mobile App. 2. Select “Cardless Withdrawal” to create a transaction request. 3. Choose the account where the amount will be withdrawn. 4. Type in your nominated 4-digit PIN and the amount you wish to withdraw. Once done, a 6-digit PIN 2 will be generated which is valid within 30 minutes only. After getting the two PIN codes, the user may then proceed to any Metrobank or PSBank ATM to start the Cardless Withdrawal transaction. Up to Php10,000 will be allowed to withdraw in a single transaction, and can take up to Php30,000 daily.